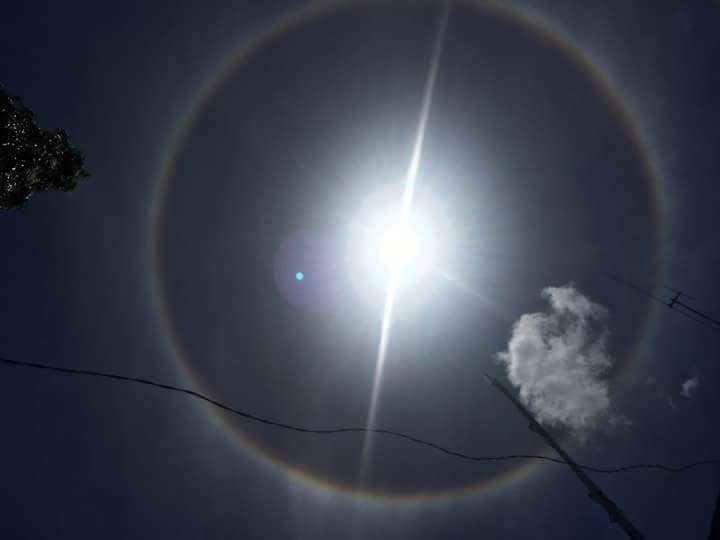 Residents in Ubay town in Bohol province were treated to a rare phenomenon last week when the sun appeared surrounded by a halo of light. Scientists said a sun halo is a natural optical phenomenon where light reflects tiny ice circles in the lowest level clouds. A sun halo occurs on days where humidity in the air is especially high. Ubay experienced hot weather on weekdays, while some parts of Bohol were having a light rain shower and cloudy skies. Rey Tubo, who saw the rare phenomenon, said that he was mesmerized of the sun and decided to take some photos and posted these on his Facebook account. Engineer Riche Cutamora Ibale also uploaded a photo he took on the sun halo and captioned it: “Called as 22 degree halo or a sun halo, the ring is caused by sunlight passing through ice crystals in cirrus clouds within the earth’s atmosphere.” He even used the hashtag #SunHaloDay #22DegreeHalo. If other residents were amazed by the appearance of the sun, some feared the appearance of a halo around the sun might be a bad omen. “We should pray to God because the sun halo is a sign of bad things to come,” said Norfa Veseres, 70. But the Philippine Atmospheric, Geophysical and Astronomical Services Administration (Pagasa) said the rare solar halo circling the sun has a natural explanation: It is formed due to high clouds. Scientists call it the halo because it has an approximate radius of 22 degrees from the sun. The halos occur when sunlight refracts through a high band of cirrus clouds more than 20,000 feet above the ground. According to EarthSky.org, the sunlight bounces off these crystals making the waves change direction, this is refraction, and this gives the appearance that the sun has an extra halo of light surrounding it. “Halos around the sun or moon happen when high, thin cirrus clouds are drifting high above your head. Tiny ice crystals in Earth’s atmosphere cause the halos. They do this by refracting and reflecting the light,” it said. On the other hand, lunar halos are signs that storms are nearby, it added.